My sister Melinda and I have been participating in the Susan G. Komen Race for the Cure® since it started in Tulsa 1996. The first few years I met my sister, Melinda and her friend Patty, to walk. We walked every year and along the way recruited our nieces to walk, then Melinda had a daughter in 2001 that started riding in the wagon for the race the first few years after she was born, then my niece had a baby in 2007, so we brought the wagon again so everyone had a means to finish the 5k walk. We always planned on walking the race every year but we were committed to fundraising; we would just showing up and walking the race year after year. I was diligent in having a mammogram every year at SF Breast Center. In fact, I was able to schedule mine and my older sister’s and we would go the same day with back to back appointments. I had made these appointments together every year for at least ten years and they happened to always fall in November. In 2012 we had a snow storm in November and I had to cancel our annual mammograms. I never really thought about it again and didn’t realize that I had never rescheduled it that year until I went in for my annual mammogram in November 2013 the following year. Everything seemed normal as I got ready for the exam. Dreaded these appointments somewhat simply because I had very small breasts and never had children, so this was all a hassle. I had the mammogram and yes it was uncomfortable but got it done like I had so many times in the past and was ready to get back to work. The protocol there is after your mammogram they take a quick look at your film and you wait until they come back in and tell you to get dressed. Knowing everything was fine I went ahead and got dressed before they came in to release me. The lady came back in and told me that she was going to take me to a different waiting room that they were going to order an Ultrasound. When I was in this different waiting room I began talking to the other women in there waiting like me, well come to find out they all had experienced breast cancer. I was able to get the Ultrasound that day and boy was I tender. At that point I had a feeling this was cancer. The call came the next day telling me I had breast cancer. I was upset but glad that it was me that had it and not either of my sister’s that were mothers. The Breast Center wanted to do a biopsy, so we scheduled that right away. After we did the right biopsy, I saw the surgeon and scheduled a lumpectomy. I was thrilled this was going to be done before the end of the year. The Breast Center called me back and looking at my films decided to go ahead and biopsy my left side too before my lumpectomy just in case. The bad news was I couldn’t get an appointment to have the biopsy done before the end of the year and had to cancel my surgery until I could have the biopsy. Those weeks through December not being able to schedule anything made me upset, scared and nervous. I just wanted to get this done. I finally had the other biopsy in January and everything looked well, no tumors therefore they moved ahead with the lumpectomy in January. I also had all the tests done to find out if I was high risk or low risk and they determined I was low risk, so I only had to have 30 radiation treatments without Chemo. I have been on all three chemo pills since 6/3/13, changing throughout the years as the side effects were too much with some of them. Finally I got permission from my Oncologist to stop taking the chemo pill on 5/17/17 because my quality of life sucked. I’m off the pill and feeling better every day, thank Goodness! Throughout all the procedures I also had a hysterectomy and now I am feeling better than I ever have. Needless to say the Susan G. Komen Race for the Cure means more to me now and I work at getting donations and recruit friends and family to walk with us and try to have a bigger team ever year. 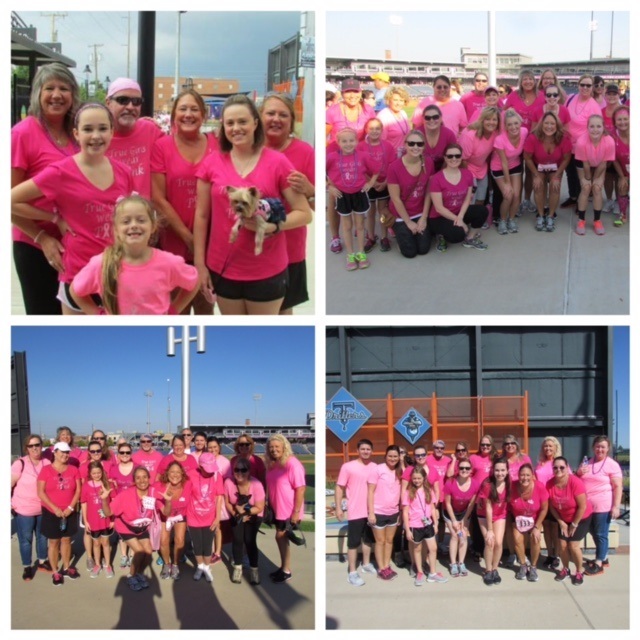 I want to say thank you Susan G. Komen Tulsa for assisting Oklahoma with Research and Resources because it takes a village.